on the cover it says "Nilbog: Not a one goblin town" Should it be 'Not a one goblin in town'? D'OH! That is what I get for cutting and pasting directly from the chapter sync sheet that came with the MP3. I changed the line to be "Time has not been kind to the Ewoks". Thanks for pointing that out, I appreciate it. Shouldn't that be Lowtax thinkpak? Gammer, you could have set your DVD screen cap program at "random" and found something good! Great screen caps! Just seeing them makes me laugh all over again. I actually typed that out myself then I hit the delete button!! Ya' down with O.T.T? Yeah you know me. What's wrong with "Nilbog: Not a one-goblin town" ? I think it's kind of a nice pun! I was also hoping to get the screen shot of the close up of Grandpa's beard on my cover. Again, too many to chose from. Kind of like the buffet at the Bellagio...... too much from which to choose. 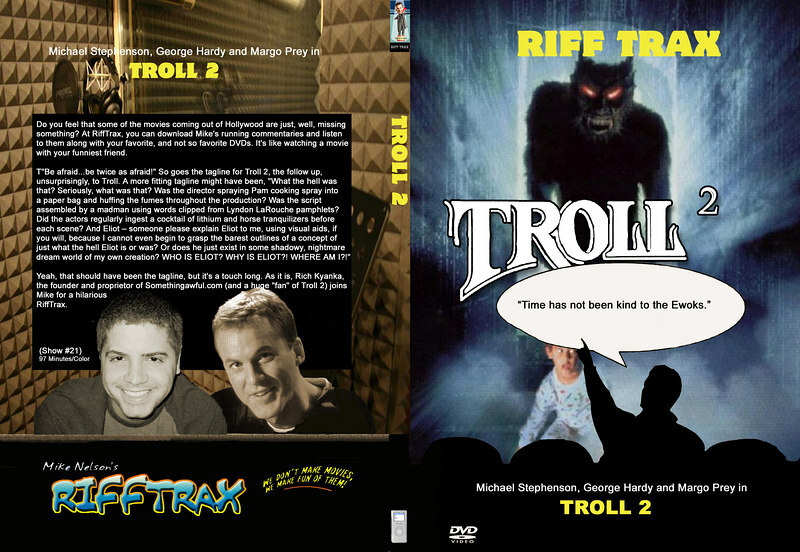 Download it now at www.mst3kdvdcovers.com! And MrTorso's cover is now posted.